Photo # 1 – Where to begin, where to begin? There’s so much, really. First off, let’s go with the t-shirt well before we even begin to comment on this little girl. “What happens at Grandma’s Stays at Grandma’s.” Um, yeah. Is Grandma in Cancun on spring break, because that’s the only time I’ve ever really heard that expression used. What does happen at grandma’s? Is this girl getting abused by grandma and the t-shirt is just a friendly little reminder to keep her mouth shut? If so, I say “run little girl, run!” Don’t let grandma bully you anymore! On the other hand, this little girl actually looks like what happens at grandma’s. It looks like grandma brushes her granddaughters hair with an egg-beater and then sprays 2 cans of AquaNet all over it….and then she wets it with the hose. Then, she takes that hose and hits this little girl in the eye. Seriously, I can only imagine what these “Harriet Carter photo shoots” must be like. I may not be a professional photographer, but all they really need to do was look at the picture and then say to themselves, “You know what? We should totally take this over again.” It really is that simple. 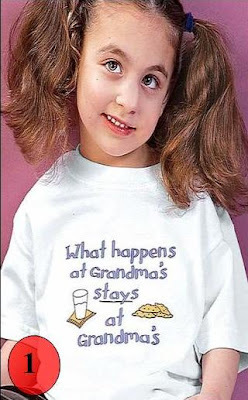 Again, if this little girl is “what happens at grandma’s” then stay the hell away from grandma’s. They would have been better off putting that shirt on a dead woodchuck and taking the picture. Ok ok, I’ll be roasting in hell if you need me. Let’s move on. Haircutting has never been easier and it never looked more fun! 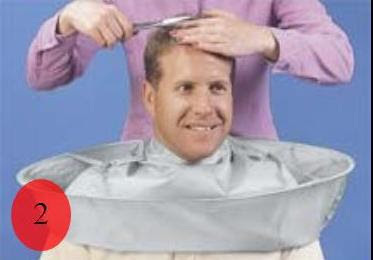 Nothing says “$100.00 haircut” quite like that contraption. That’s actually what it is; a contraption. I can almost hear this dude saying to his wife, “Honey can you give me a haircut?” And then she replies back, “Sure, honey, get the contraption.” What a complete horror show. This guy makes me so mad I hope he goes bald and then they can throw away that contraption. Photo # 3 – Like I said before there are two things that Harriet Carter seems to be obsessed with; horses and death (but not combining the two). Harriet always likes to remind you that you are missing someone in your life. This time her death stone says the following: “If Tears Could Build a Stairway and Memories a Lane, I’d Walk Right Up to Heaven and Bring You Home Again.” Ok, so first off the words “lane” and “again” don’t rhyme, unless you say the word “again” with a British accent and say it like, “ah-gain.” Stupid. Second of all I kinda get the tears part for building stairs, but why the hell would you need a lane? 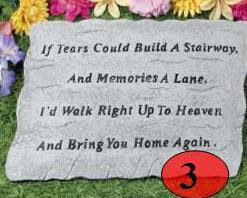 My guess is that you probably would have the only stairs going up to heaven, so would you really need a lane for that? I mean it’s not like there will be tons of stair traffic. And I’m all for you walking up to heaven, but that’s a realllly long walk. Say for example I was in heaven. If you showed up and was all like, “hey I built some stairs, you wanna come back down to earth?” I’d be like, “thanks, but not really. Heaven is cool. I don’t have to work, I can eat whatever I want, and I have the best tan.” Good luck with the walk back down to earth jackass. I mean, not for nothing, but I’m not going to back to earth and have to re-open my checking account and beg my job to take me back. I kinda like not having to pay a mortgage. I’m all set, thanks though. Have you ever been walking down the street and had a wild dog with rabies foaming at the mouth just for you? Are you usually not into it so much? Well lucky for you Harriet Carter has has a major technological breakthrough. By just pushing this little button you can freeze a wild dog right in its tracks! Ok, so let me get this right. 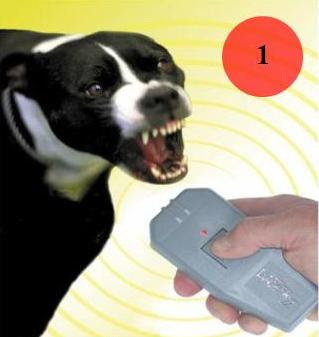 If I run into a dog that literally looks like it is Satan’s puppy I should reach for my remote control that I just happen to carry with me wherever I go and press the button? Yeah, I’m actually not looking to Tivo that dog, I’m just trying to stay alive. By the time I can get that huge friggin remote out of my pocket the dog would have clearly already bitten off both arms and working on my second leg. Yeah, I’m not sure if I trust this $19.99 security system. I may not be a rocket scientist (although I actually am), but I think that I would be a little better off with a gun then a remote control. Thanks Harriet, but I’ll pass on this one. Do you ever like to just destroy things just for the hell of it? Well so does this lady! Does getting out of the car by simply pulling the handle seem a little “boring” to you. Me too! Thanks again Harriet Carter! 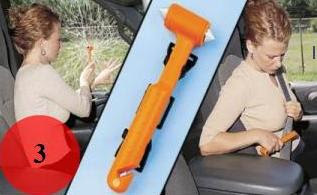 Now getting out of the car doesn’t have to be so old-fashioned anymore. All you need to do is use this trusty little tool. First, pull into your driveway. Second, take this tool and use the razor end to slice the seat belt off of you (don’t just press the buckle like an animal). Third, take the other end of this tool and break the window. Finally, shimmy yourself out the window and through the broken glass. Don’t worry about the cuts and blood. That’s nothing the hospital can’t quickly fix! In just 4 short hours you’ll be back home and watching TV sipping on water and popping Vicodin. 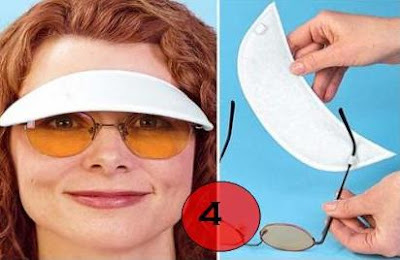 Ok, so maybe I could think of a reason why you would need something like this, but this lady totally is safe. I mean, there aren’t any flames, her car isn’t smoking, she hasn’t been in a crash, it’s a sunny day, and I think I see kids playing hopscotch in the background. Haha I LOVE this. 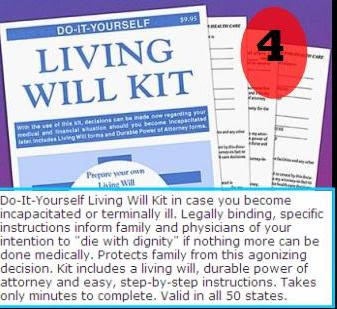 “Die with dignity?” Seriously, you just filled in a do-it-yourself will. How much dignity can you have? What are you really planning on leaving your family? If this is your legally binding will your items you will probably leave to your family will consist of the following: ketchup, old bowling shoes, three # 2 pencils, a tin-foil ball, and mousetraps. This thing only takes minutes to complete. Now you know it’s official! I hope Harriet fills this out. I wonder what she’ll leave me? I hope something that has to do with horses. R.I.P.